So I’m all about looking for some awesome household tips and tricks that’ll make things easier. And probably one of the best places to find great ideas is from our grandma. She taught us a lot of practical ideas that help with cleaning and organizing our kitchen, bathroom, bedroom, and other room of the house. 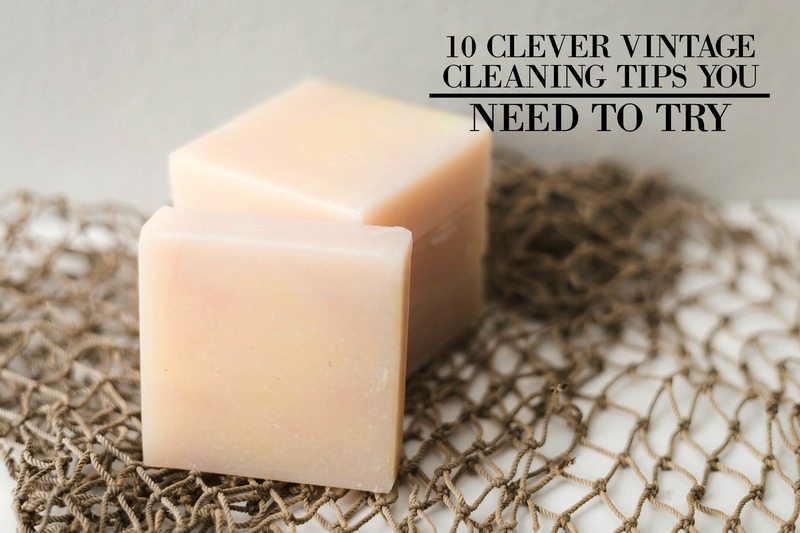 And because most of you love my previous post on vintage cleaning hacks, I decided to make another one. I found some more amazing cleaning tips that are fail-proof, easy to implement, and are all natural. They’re a lifesaver and worth to try. So feel free to check them out down below and let me know what you think! Whenever you’re dusting your appliances, furniture, and fixtures, always start at the top and work your way down. This will help you avoid going over the work you’ve already done. In addition to the above tip, make sure you’re using a damp cloth when dusting. Compared to feather dusters that simply spread the dust from one surface to another, damp microfiber cloths are a much better option. Instead of buying some expensive kitchen spray or wipes, make grandma proud and try this hack out. Take a half of grapefruit, then sprinkle salt on top of the counter and rinse away with hot water and a sponge. It’ll be sparkling clean in just a few minutes. With overtime use, your dishwasher can accumulate dirt and grime that can affect its functionality. So to easily fix this, pour one cup of white vinegar into the bottom of your empty dishwasher and run through a cycle. Before you know it, it’ll be sparkling clean and odor free. As used in many household cleaners, lemons are great natural ingredient. The acid in the fruit works well in removing stains, dirt, foul odors, and grease. I’s also a great antibacterial and disinfecting green cleaner. So forget the toxic commercial cleaners and go for something safe and natural. If you have a carpet at home, try regularly vacuuming it to get rid off all the dust and stale odors. This will make your floor clean and help you avoid spreading dirt throughout the home. To naturally freshen the air in your home, try placing some lavender in a vase. It not only makes your home smell great but it can also be used as decor. Did you know that by simply getting simples chores done daily, you can prevent having to do all the work in one big cleaning session? Try making your bed after waking up, throw the garbage out daily, and finish all the dishes before going to sleep. These are just simple cleaning chores that’ll keep things in place. We all have that favorite mug that gets nasty brown ring inside because of coffee or tea. So to quickly fix it, gently scrub the inside of your stained mugs with salt and a cloth dampened with vinegar to remove the stains. Wash and rinse after, and it’ll look new and clean again. Before you throw out all your rusty utensils, give them new life again and try out this simple trick. All you have to do is saw your knife (or other utensil) back and forth into an onion and the rust will begin to come off. The sulfenic acids in onions are the key ingredients in getting your blades clean. Before you spend too much time buying expensive home cleaners, try these frugal cleaning tips and save money. They’re all easy to do, have great results, and will definitely make your life easier. So give these hacks a try and let me know what you think! Now if you have any questions about this post, let me know in the comments down below. I’d love to hear about them!